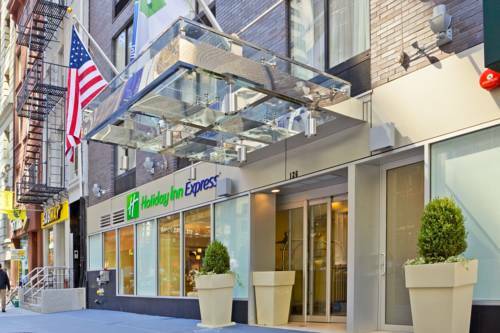 Located near Wall Street Steps away from Wall Street, the Holiday Inn Express� Hotel New York City - Wall Street is situated in the heart of the Financial District. Whether you're in town on business or for a New York City vacation, this hotel's location in lower Manhattans convenient for all travelers. Moments from Wall Street, the New York Stock Exchange, City Hall and the Federal Reserve Bank, this New York City hotel offers corporate guests the utmost in service and amenities. Free wireless internet access makes staying in touch easy, and the Business Center is there for support. The Big Apple is brimming with exciting attractions, and this hotel's location in NYC is minutes from everything. Must-see attractions like Ground Zero, the Statue of Liberty and Ellis Island are only blocks away from the hotel. You can enjoy the outdoors at nearby Battery Park or hunt for bargains in the numerous SoHo, Chinatown shops and boutiques. Additionally, we are within walking distance from the subway making it easy to explore the entire city. The Fitness Center helps you maintain your workout routine while away, and you can join us each morning at the free Express Start Breakfast Bar, which features a number of hot and cold items including our famous cinnamon rolls. Our friendly staff looks forward to welcoming you to Manhattan. Various shops from men's and women's apparel, shoes and accessories boutiques and local boutiques. Wall Street is in financial district in lower Manhattan. Battery Park (also known colloquially as simply The Battery) is a 25-acre (10 hectare) public park located at the Battery, the southern tip of Manhattan Island in New York City, facing New York Harbor. Manhattan's Chinatown, home to one of the highest concentrations of Chinese people in the Western hemisphere, is located in the borough of Manhattan in New York City. Manhattan's Chinatown is one of the oldest ethnic Chinese enclaves outside of Asia. The Neighborhood. SoHo is a neighborhood bounded roughly by Houston Street on the north, Lafayette Street/Centre Street on the east, Canal Street on the south, and West Broadway on the west. Known for it's unique boutiques and wealth of art galleries.